Have you registered for Bank Of India net banking service and received user id and passwords but wondering how to login first time in Bank Of India internet banking then this article is for you. Here we are going to discuss the step by step instructions for new internet banking users. Step 2. On the left hand side of the home page of the website just below the bank's logo, you will find 'Internet Banking'. Under internet Banking there are four options, go to the first option 'Retail' and click on it. Current account holder click on the 'corporate' button. Step 3. It will open a new pop-up window. Wait for few seconds and it will disappear and a new window will open up. Step 4. In this new window, you can see the empty fields for 'User Id' and 'Password', under Retail Login section. Write the User ID that your bank branch has provided to you and write the login password at the second empty box and press 'Submit' tab. Step 5. 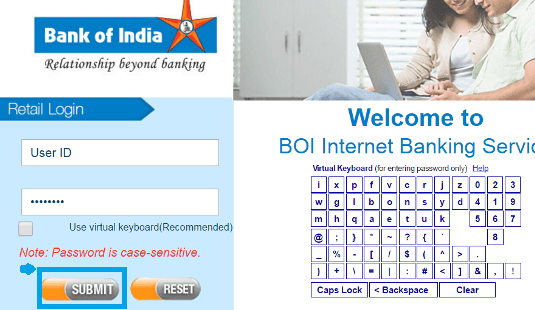 A new page will open up with terms and conditions of Bank Of India Internet Banking use. Go through the terms and conditions and click 'Agree' tab at the bottom of the page once you read all the instructions carefully. If you want to save it for future reading then you can do so by copying it to word doc. Step 6. This will open up another new page. 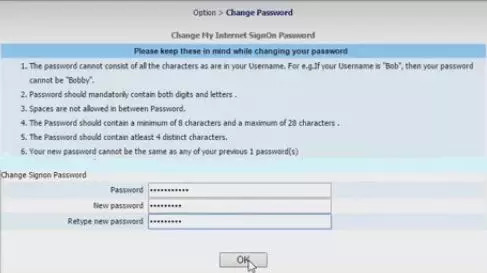 Here you will change your login password. Password change is mandatory for first time users to avoid any risks of Internet Banking. Enter your 'current login password' at the first empty box, just adjacent to text Password. Enter your new desired password at the second empty box, just adjacent to 'New Password' text. Now, enter the new password again in the third empty box, just adjacent to text 'Retype New Password'. Now press the 'OK' tab to complete this process. Step 7. A new pop-up window will open up with password changed confirmation message. Press 'OK' tab. Step 8. In the next page, go to text 'Click Here To Go To Banking Service Home Page'. You will find Here is hyperlinked. Just click on 'Here' to go to the next page. Step 9. 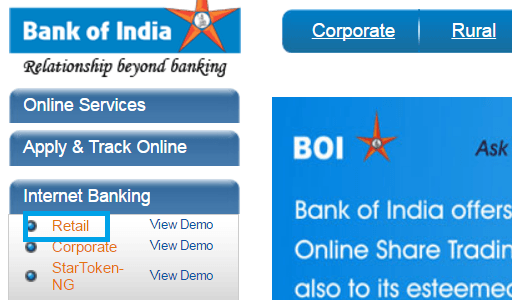 Now, you are in the home page of Bank Of India Internet Banking Service. You can perform various transactions using this service online. 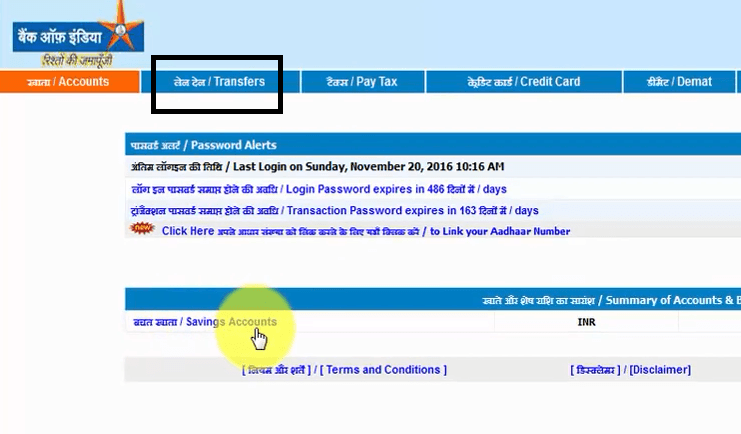 Now you can add beneficiary and transfer fund from BOI to other banks easily. I hope this article has helped you know how to login first time in Bank Of India internet banking successfully. Very bad services bank of India I don't like this I will close my account for bank of India. boi net banking online registration is not working. SO WHAT IS MY LOGIN USER ID? try to use cif number as a user id. Sir, I had applied for net banking for boi a/c. I have received my login and transaction password.but my ppf acc. No show and no fund transfer. I registered for Net banking. However, I got only my user id and no password for my login. How to log in first time to the bank of India corporate net banking? I have received a User ID and password for Login and transactions.I submitted the Step2 page Acknowledgement to the Kalyan (E)branch about 10 days before.But till now my account neither activated nor I can't do Login or do any Transaction.Please do the needful immediately. What to Do If Your SBI ATM Card Number Gets Erased?